It's a blog for reading. ‘ 42 Fools’ is an original television series based on the idea of “no reoccurring characters”. Episode Fourteen – “The Revelry & The Rivalry” is now a finished draft. Because this is an ongoing original work, it’s not posted as a link here. If you’d like to read it, please contact me using the information provided. Just a quick post to say that NaNoWriMo was a success. Much coffee was consumed. Many letters were typed, and many words formed out of those letters. Hark, sentences were then formed out of words. Thusly, paragraphs. From the paragraphs, pages. In the end, I was able to top the 50,000-word mark before the end of the month, and the result was a draft of The Tripling Tales, a collection of previously-untold fairy tales. Of course, it still needs a lot of work. But the challenge was met. High-fives. And if you’ve never heard of NaNoWriMo, check them out here. It’s an excellent organization, and they have a ton of great youth programs as well. 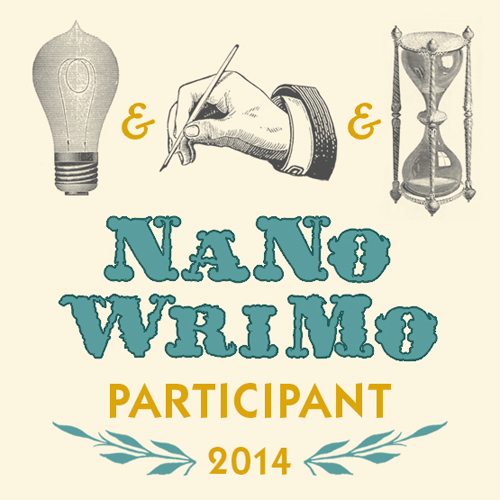 The start of NaNoWriMo 2014 is mere hours away. This is the obligatory blog post that tells the internet that I’m participating. If you’d like to get involved, click here. Or here for the Young Writer’s Program. If you read or follow many blogs, you’ve probably found that if someone doesn’t post anything in six months, there’s a high probability that they’ve stopped entirely. Not so with this blog. As it happens, I’ve spent the time in between then and now finishing and revising a book. A book? Yes, a book, with dozens of words, and even entire pages. Because of first-rights publishing standards, I won’t post any of it here, but I promise you, it exists. “No one is quite sure what to call Pendelum Nil. Is he a Dis-enchanter? An Un-magicker? A De-incantationer? No one seems to know. However, everyone knows what Pendelum is not, and that is a wizard. Instead of being able to create magic, Pendelum has the unusual ability to take it apart. This means that Pendelum is called in whenever magic goes wrong, which is frequently. Whether it’s reversing an unfortunate amphibian transformation of plague-like proportions, or cleaning up after a wizard-battle-gone-awry, magical damage control is his business. In the Opposite of Wizard, young apprentice Pendelum Nil finds himself working with the best (and only) in the anti-magic business. This includes Eledy Willow, an anti-mage who is completely and utterly immune to magic, Monteblanc, who is a ghost, and his boss-and-or-guardian, Allister Wicke, who has recently had a magic-related accident of his own. Pendelum’s assignments, which range from the mundane to the potentially-fatal, gain him both grateful clients and a handful of accidental enemies. As always, if you feel like reading a few chapters, feel free to contact me. ‘Doctor Who’ is a long-running BBC Science Fiction Series based on the exploits of a centuries-old alien time traveler known as The Doctor. If you haven’t seen the series already, you’re missing out on one of the most inventive shows currently on television. And everything is better with an accent. As of this writing, the vast majority of the ‘rebooted’ series and many of the surviving classic episodes are available on Instant Streaming through Netflix and Amazon Prime. If, like me, you started watching the modern series without any other background in the show, I would suggest giving the show two seasons before you make a final judgement to continue watching it or not. If you’re really in a hurry, or are having a hard time getting into the series, I would suggest watching ‘Father’s Day’, ‘The Empty Child’, ‘The Doctor Dances’, ‘Bad Wolf’, and ‘Parting of The Ways’ in the first season. In my (highly debatable) opinion, the first Series sometimes has a hard time finding its stride between what made the ‘old’ series fun and the possibilities of the ‘new’, so it can be difficult to get into. I watched every episode, but I add the other option as a begrudging alternative. My attempt at writing a script for Doctor Who is linked below. This script is intentionally written as a stand-alone and concept-driven episode, not meant to interfere with any of the show’s larger, overarching plots. Similarly, the characters are referred to as generic names – simply ‘The Doctor’ and ‘Companion’, in an attempt to keep the script out of any existing continuity. As a side note, because of its premise, the script includes far more ‘action lines’ and emotional directives than I would normally include. My attempt at writing an episode is presented, like the show, in a roughly forty-five-minute script. As part of this project, I also wrote some notes on the writing process, as well as a few ‘lessons learned’ in the attempt. If, for some reason, you feel like reading these, there’s one more link below. Like any aspiring writer, I’ve read at least a dozen different articles and books addressing the oft-cursed, little-understood Writer’s Block. Most of these articles are quasi-inspirational, useful, and even insightful. But after reading one, you’ve basically read them all. Most of the suggestions are universally echoed: follow a schedule, believe in yourself, make a painting. So what follows are a few suggestions that I’ve never seen on any such list. Improvisational Theater is an art form that requires very little space, very little prior experience, and an insane amount of flexible creativity. This is the art of making something up right now, right away, with other people. In Improv, every scene is essentially a case of Writer’s Block, and it’s your job to overcome it instantly. Learning how to do this on a stage or in a Community Theater classroom can severely improve your ability to do it on paper. But wait, you say, I’m a pseudo-stereotypical writer. I’m incredibly introverted and shy and I don’t like being the center of attention, or acting, or playing Charades in social situations. To you, I say, get over it. Most class venues are extremely low-pressure, overly inclusive, and are completely fine with someone just taking a beginning class to try it out. And of course you want to be the center of attention, because you’re writer. Writer’s Block may just be your own subliminal mind telling you that what you’ve written isn’t really all that good. And that it may even be a waste of time. If you’re not excited about writing it, no one is going to be excited about reading it. Now, before you start screaming at me about how Stephen King once threw away Carrie before getting it published, listen to what I’m really trying to say. I’m not telling you to throw away your nearly-completed novel because the chapter that sets up the emotional climax has difficult dialogue. I’m not saying to delete your only file or burn your only manuscript. I’m saying that most published writers have a folder that houses all of their unused ideas. It’s possible that the idea that you’re forcing yourself to write needs to be an unused idea. If it doesn’t stay in that unused folder for very long, because you just have to write it, congratulations, you’ve overcome Writer’s Block. And keep in mind that many excellent ideas began life as two separate and mediocre ideas. Orson Scott Card is notorious for combining two concepts that could each be stories in and of themselves. This is just what it sounds like. Invent a character with absolutely no intention of using that character in any other context. And I’m not talking about the old acting exercise where thespians create useless backstory for their stage characters (i.e. The frosting on the cake for her seventh birthday was chocolate with red sprinkles). Because no one watches Cat On A Hot Tin Roof and says, “Wow, you could really tell that Maggie’s seventh birthday was a happy one. That really came through, because you could see it in her eyes.” I’m talking about creating an original character. A one hundred and fifty-year-old woman. A time-traveling monk. An ultra-normal mother of three. A bus driver that has a degree in Applied Thermonuclear Physics. Tom Stoppard has said of The Real Inspector Hound that he originally had no idea how the play was going to end. Essentially, (and I’m paraphrasing here) he just put all of the characters in one room and watched what happened. The great thing about writing a character instead of a story is that Writer’s Block is almost impossible. Either you have a character, or you don’t. As an optional exercise, take the characters you do have, extract them from their stories, and see how they measure up to the ones you just created. When I was in High School, we had a TV with only a rickety antenna, which left us with roughly six viable channels. Three of these six channels were in Spanish, and they were the only ones that came in with any consistent clarity. So I’ve done this several times. The most interesting thing about this exercise is that your mind creates dialogue and a basic story, despite you having no idea what the story is actually about. Eventually, you start to realize what you hope the story will be about, and what you hope will happen, and what you want the characters to be saying. Most of the time, this exercise is just entertainment. I once watched the movie Simon Sez in Spanish, which featured Dennis Rodman, and an as-yet-undiscovered Dane Cook. It was one of the most unique things I have ever experienced. But it can also help you learn what kinds of things you want to see when it isn’t exactly certain what you’re seeing. And this, in a very roundabout way, can help with Writer’s Block. I don’t mean that literally. Or maybe I do. What I really mean is, figure out something that you like to do more than writing. No matter how great, or prolific, or dedicated the writer, everyone has something. Most of the time, that thing is just more attractive because it’s easier than writiing. For me, it’s usually videogames. So the new rule is that you’re not allowed to do that thing until you’ve completed a certain amount of writing. No exceptions. Wait, you say. I saw something kind of like this in another essay on Writer’s Block. This isn’t even close to unorthodox. Find something you love. And kill it. Unless you write. Break off your engagement to your girlfriend of five years. Unless you finish your book. Put down your beloved Golden Retreiver. Unless you finish that epic poem. Buy tickets to see that band’s final show before they break up forever, and do not go. Until that screenplay that you’ve been telling people about for the last five years is actually sitting in front of you. Don’t actually break up with your Golden Retreiver. Or do. I’m just saying. I bet you’ll finish that short story. So there are a few more things to throw into the ‘cliched writing advice’ pile. But that’s all I’m going to say about it. Because now I actually have to go write something. Last month was National Novel Writing Month, or the only-slightly-abbreviated NaNoWriMo. I managed to successfully complete the required novel-estimation goal of 50,000 words (this is where I jump up and fist pump in mid-air). I finished the month at 50,100 according to the in-site word-counter, hence the banner below. Of course, I’ll need to do some writing and re-writing before I’ve got a finished draft. The story itself turned out to be considerably longer than the fifty thousand word goal. By my guess, the book is about two-thirds done. For anyone interested in the organization and what they do (they have a really awesome Youth Writing Program as well), links are below. If you feel so inclined, donate here. This month is National Novel Writing Month, or the only-slightly-abbreviated NaNoWriMo. As you might have already guessed, I’m participating, so any other updates this month are extremely unlikely. On the other hand, if all goes according to plan, at the end of the the month I’ll have an entire book. Invader Zim was an animated television series created by Jhonen Vasquez for Nickelodeon. It ran for two seasons starting in 2001, but the last completed episode wasn’t aired until 2006. The show follows the anti-adventures of a would-be alien invader (Zim) his malfunctioning robot (Gir), and the boy who tries to stop him (Dib). The show is consistently dark and surreal, which earned it a loyal cult following and got it canceled relatively quickly. If you haven’t seen an episode, try an internet search and see what you come up with. The show has been on and off Netflix, and the DVDs are notoriously difficult to find. My attempt at writing an episode (presented, like the show, in two smaller parts) is below. The second script involves a minor character that was planned to have more appearances before the show was canceled. Knowing that episode helps, but the relationship should be pretty obvious. ‘42 Fools’ is an original television series based on the idea of “no reoccurring characters”. Episode Five – “The Siblings And The Split” is now a finished draft.